When Jack Cashin was in graduate school, he would perform odd jobs to pick up extra cash here and there. One day, he was hired by renowned film director Robert Altman to fix a machine that wasn’t working in his office. While Cashin was there, he overheard Altman talking about how frustrated he was with the sound quality of the dialogue in his last film. Altman’s trademark was overlapping dialogue, but there was no filmmaking technology on the market that allowed him to capture the different voices clearly. The 22-year-old Cashin took a chance and politely interrupted the conversation. He mentioned that the record industry had been capturing the sound of different performers on separate channels for years and suggested Altman consider the same approach. He got a blank stare in return. “I thought, oh well, I guess I’m not coming back,” he remembers. But a few days later, Altman called to offer Cashin a job. His wife, Felicia, took over the company’s general business operations in 1986. At that time, Jack Cashin was operating out of his unfinished house in the Malibu Hills. “His desk was just piled with unread mail,” she recalled. However, with her organizational skills and customer service expertise, they were able to bring USL to new heights. USL helped producers make films with stereo sound and also manufactured equipment that allowed movie theaters to play films in stereo. Jack Cashin received two Technical Achievement Awards from the Academy of Motion Picture Arts and Sciences, and he was awarded the Samuel L. Warner Memorial Medal Award from The Society of Motion Picture Television Engineers in 2001. 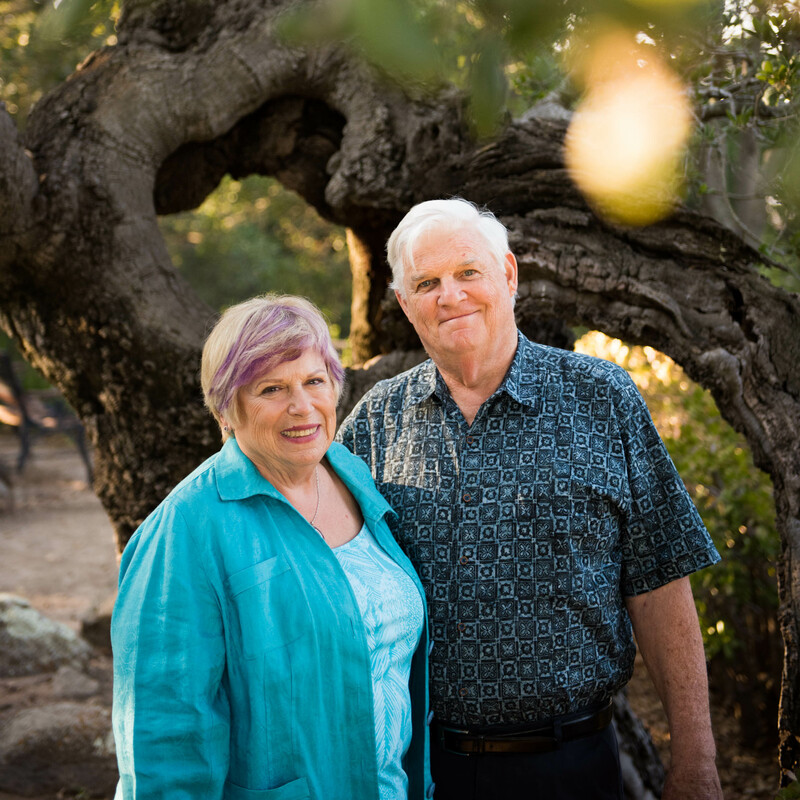 In 1997, the Cashins moved the company from Malibu to San Luis Obispo, where they would later get to know Cal Poly students and faculty. Around this time, USL also transitioned into building high-end digital audio and video products. It was no longer just a sound company, and USL played a significant role in cinema’s transformation to digital imaging. Jack Cashin had always loved the movies, but his father insisted he study “something useful” like accounting or engineering. So after completing an undergraduate degree in engineering, he set out to study what he really enjoyed and enrolled in USC’s graduate program for cinema. 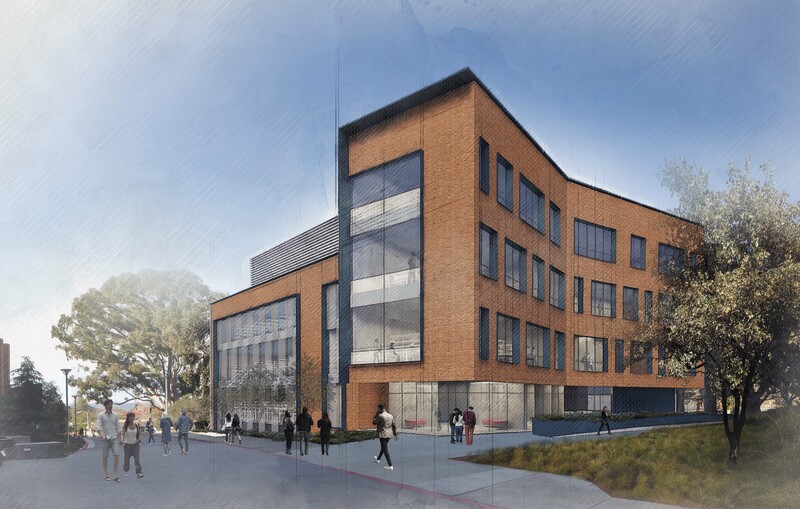 The Expressive Technology Studios at Cal Poly will be a home for LAES majors; students enrolled in the science, technology and society minors; and any student who is looking for a place to collaborate at the intersection of art, humanities and technology. Filmmaking falls right at the center of this intersection, and the Cashins are excited to help provide a sandbox that allows students to flex their creativity and experiment with professional technology. 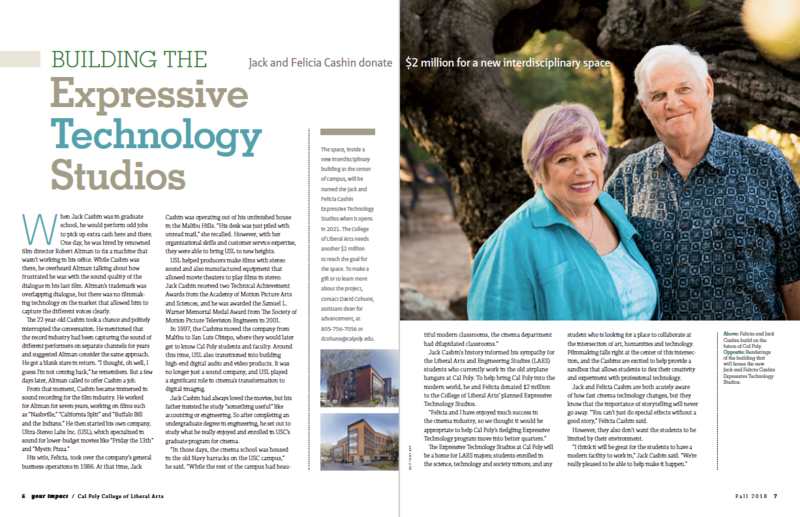 Jack and Felicia Cashin are both acutely aware of how fast cinema technology changes, but they know that the importance of storytelling will never go away. “You can’t just do special effects without a good story,” Felicia Cashin said. However, they also don’t want the students to be limited by their environment.